President of Elections Commission (EC) Ahmed Shareef on Sunday stated that there are no legal grounds to annul the results of any constituency in the parliamentary elections that took place on April 6. Shareef gave the statement in response to reports that a case is to be submitted to the Supreme Court to nullify the elections of Thulhaadhoo constituency in Baa Atoll. Maldivian Democratic Party (MDP)'s candidate and lawyer Hisaan Hussain won the seat. According to local media Mihaaru, the case is to be submitted to the top court accusing EC of unlawful proceedings in the elections. 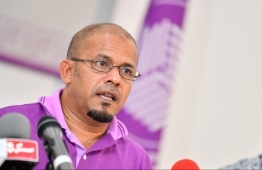 The complaints were in relation to allegations that the electoral watchdog withheld the rights of Mohamed Atheef, contesting for Thulhaadhoo constituency on Progressive Party of Maldives (PPM)’s ticket, after PPM withdrew support at the last moment. PPM withdrew their endorsement for Atheef due to the agreement to concede certain constituencies to Jumhooree Party (JP) and to independent candidates. An audio recording regarding the decision to submit the case to the Supreme Court was recently leaked. Speculations arose that one of the voices in the audio, questioning the documents relating to the case, belonged to lawyer Ahmed Zaneen. However, Mihaaru reports that Zaneen denied knowledge of an audio recording, and opted to opine at a later time. It was revealed in the audio recording that one of the individuals allegedly had letters from PPM and EC. Moreover, the individual stated that the decision was made to submit the case to the Supreme Court, on full confidence that they would win the case.